Home > Shop By Brand > CarPro Innovative Nano Coats > CarPro Eraser Intense Oil & Polish Cleanser 1 Liter Refill > CarPro Eraser Intense Oil & Polish Cleanser 4 Liter Refill > CarPro Eraser Intense Oil & Polish Cleanser 16 oz. - On Sale! Eraser goes a step farther with an intense cleaner that dissolves oil. It also attracts the dust left by compounding. When you wipe down your vehicle with Eraser Intense Oil & Polish Cleanser, you’re removing oils, fillers, and dust completely. 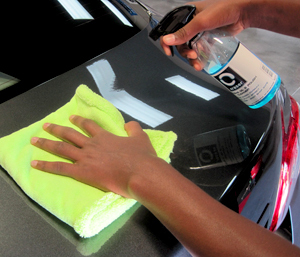 Once you apply CQuartz, it will bond better and create an even, long-lasting shine with great protection. Eraser also has anti-static components to resist dusting after wiping. The paint will stay dust-free while you’re in the process of applying Cquartz so you don’t have to keep re-cleaning. Eraser contains no silicone and is completely safe for use in paint shops and body shops. Great before applying Cquartz or any other type of coating. No need to have to break down other products to make the same as what is in the bottle. Smell isn't horrible and it's super easy to work with. Prosworks a lot better than ipa, smells great.